This page is mostly just for reference, it shows the features that I was able to find on each program’s website or elsewhere on the Internet. Requires OpenGL, but can use entry level video card. Program is in beta, some functions are planned. Detachable color and part bin windows, of which you can have multiple instances or none at all. Extensive (optional) LDraw source window, with full nested editing support and a growing selection of line type property editing dialogs. LDraw file reloading and external changes detection, and you can finally close files now. Library part (shadow) editing, mostly intended for myself in order to add part snapping info so it is disabled by default and far from a full LDraw part editing solution. Compressed (e.g. complete.zip) library support. Bin window(s) can be used at a smaller width. And many more tweaks and adjustments etc. I also added almost 600 new part snapping files to the default shadow library including info for doors, windows, windscreens, fences, bars, antenna’s, plane parts, boat parts, minifig hats/hair and minifig accessories. Do note some (especially the doors and windows) need some additional work as I’m not sure how they behave/fit in real life any help on that is welcome. The program features a palette of bricks and parts in different colors, that can be used to build any model imaginable, but only a subset of the bricks made by LEGO are available for use in regular mode, but the more comprehensive LDD Extended mode allows any brick to be put in any color, but these were not available through the Design byMe service. There is also a mode for viewing, in which screenshots can be taken and the model can be “exploded”. The third mode is where the building instructions are automatically generated, and can be saved as a .html file. LeoCAD is a CAD program for creating virtual LEGO models. It has an easy to use interface and currently includes over 6000 different pieces created by the ​LDraw community. It supports basic animation (via keyframing) and can export to 3DStudioMax, POV-Ray, and Alias Wavefront. It has a cool little Minifig Wizard. MLCad (Mike’s Lego CAD) is a powerful CAD system specifically designed to create building instructions as known from Lego, for your own Lego models and creations. MLCad reads and writes LDraw (a program of James Jessiman) compatible files but in an extensive window based environment. The program helps to create building instructions, which show step by step how to build a model. Create pictures of the steps for use in the www. 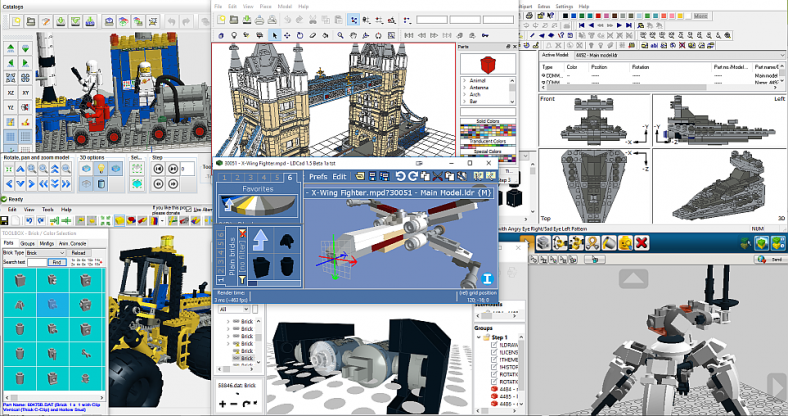 MOC Builder is an open source, free software. New exclusive MirrorBuilding features for quick build of symmetric models. MUST TRY ! !